HOW DOES A FROSTY TOWEL WORK? Frosty Towels are 100% pure cotton towels infused with a unique blend of 100% natural ingredients creating an evaporative process that allows the towels to stay cold for hours, keeping you cool and comfortable. Frosty Towels are designed to be a single use high quality cooling towel that are nice enough to keep for other uses long after the cooling effects are gone. Just open the package and shake out your Frosty Towel for a few seconds to activate the cooling effect. Lay the towel around your neck or wipe it over your arms and legs to help protect yourself from black flies, greenheads, mosquitoes, no-see-ums and many other insects. If your Frosty Towel gets warm from being against your skin, just open it up, shake it out, and re-energize the Frosty Towel cooling effects. Frosty Towels typically last for an average 3 – 5 hours depending on wind, sun, and humidity conditions. Each Frosty Cooling Towel works to help lower body temperature and maintains cooling properties for an average of 3 – 5 hrs*. Frosty Cooling Towels require no refrigeration and cool down to an average of 20-25 degrees below normal body temperature. Set your organization apart from the competition. Frosty Cooling Towels provide a unique and effective way cool down after a long day of travel or sightseeing. Easy to use and distribute. 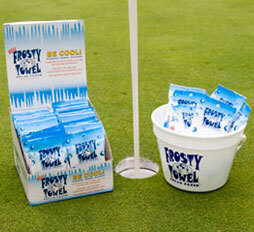 Offer your guest or customer a Frosty towel as a gracious and upscale amenity. Customize Frosty Towels with your own Logo! Frosty offers cost effective and high quality embroidery, interwoven labels and packaging sticker options using your corporate logo, event name, client logo or commemorative date. Frosty Towels are an impressive low cost and unique promotional item for conventions, corporate meetings, concerts, sporting events, golf outings, and most special events. Frosty Cooling Towels offers you a high impact item for Welcome Baskets, Arrival Gifts, Wedding Hospitality Bags and any group sales or sponsored event. Simply Open the sealed & sanitary Frosty Towel package. Unfold Towel and shake in the air for a few seconds. Place around back of neck and begin to cool down. Wipe arms and legs to deploy all natural insect repellent. If your Frosty Towel gets warm from being against your skin, simply shake towel in the air for a few seconds and cool down again. When your Frosty Towel begins to dry out from over-exposure to sun or wind, simply add a capful of water to extend the use of your Frosty Towel until the cooling properties dissipate. Instant relief from heat, humidity, and hot flashes. Offers a unique, effective, sanitary, and upscale cooling amenity for your guests, customers, and clients. Your unique logo customization creates brand awareness and marketing opportunities. Individually packaged, sanitary and anti-bacterial. Contains 100% natural insect repellent. 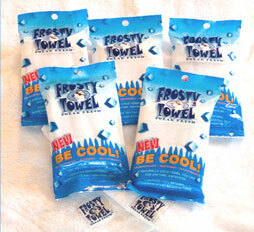 Includes resealable package to extend the life of your Frosty Towel. We use only the highest quality of 100% natural essential oils and herbal extracts. FROSTY Towels are shipped and stored warm. Refrigeration is NOT required prior to use. Frosty Towels will generally last up to 3 – 5 hours once opened*. Chilling first may extend this time frame. Frosty Towels have a generously long shelf life as long as the package remains sealed. Chilling your Frosty Towels is not required but it does supercharge the cooling effect right out of the package!